Previewed at last year’s Show, the Kudos Audio Titan 505 is a standmount loudspeaker designed to put stunning, top-of-range performance within reach of a wider range of spaces and budgets. And now, it’s in full production and ready to own and enjoy. Initially launching with the top-of-range Titan 808, Kudos Audio’s Titan series has since grown to include four models in a choice of sizes and finishes. Each model features an impressive complement of technologies unique to the series, including world-class drive units created exclusively for Kudos by renowned Norwegian specialists SEAS. 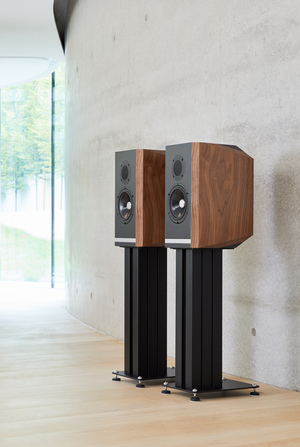 Like the Titan 707 and 606 floorstanders, the 505 is a two-way design. It shares the same superb quality K3 tweeter as the 707 and 606 - a unique SEAS-Kudos design precisely tailored for the Titans. Enhanced features include an improved magnet system with copper shorting rings, a completely new resonance chamber and a new face-plate profile, all engineered to deliver an even sharper, more dynamic and musically detailed performance. The 505’s twin mid-bass drivers are also unique to Kudos, featuring high quality coated hard paper cones to ensure superior stiffness while at the same time preserving the natural damping properties of paper. Like all models in the Titan series, the 505 sports an isobaric arrangement in which the second mid-bass driver is carefully positioned internally back-to-back with the first, delivering significantly improved midrange clarity and bass response, as well as a reduction of bass distortion. All four models in the Kudos’ Titan series can be run either passively or actively. The crossovers are engineered such that they can be by-passed in order to enable active operation with selected systems including Linn Exakt, Devialet Expert - and now also the brand new Exposure VXN. See Kudos Audio in room 206 on the second floor, partnering the 505s with the new Linn Selekt. Be sure to also check out room 212 on the second floor where Exposure will be previewing their new VXN active analogue crossover with the Kudos Titan 606 floorstander.